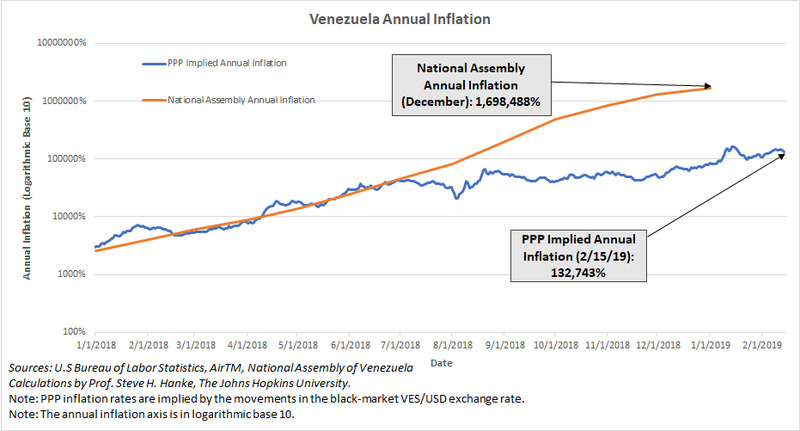 Although Venezuela falls in the middle of the pack when it comes to hyperinflation magnitudes, it is experiencing an extended hyperinflation—28 months and counting. This ranks Venezuela’s episode as the fifth longest in history. It is clear that the number one problem facing any new government in Venezuela will be to crush hyperinflation. If a new government solves the hyperinflation problem, it will gain immediate credibility. Then, it will be able to proceed to clean up the mess created during the Chavez-Maduro years. If a new government fails to smash hyperinflation and establish stability, it will face the public’s wrath and will be short lived. To smash hyperinflation, a new exchange-rate regime will be required. Venezuela has a self-proclaimed “President” Juan Guaidó, a man plucked from the opposition. However, it is not clear what his views, or other members of the opposition's, are on what would be Venezuela’s new exchange-rate regime. But, there are straws in the wind. On February 2nd, The Economist reported in a “Briefing” on Venezuela that the opposition was cozying up to Ricardo Hausmann and his “National Plan: the Day After.” This plan calls for a massive amount of foreign aid and government-to-government credit, huge write-downs on Venezuela’s debt, and an opening of Venezuela’s oil sector to private oil companies. However, Hausmann is rather short on details when it comes to solving Venezuela’s number one problem: hyperinflation. All he told The Economist is that he favored a pegged exchange rate system, as opposed to a currency board. He also indicated that he didn’t wish to discuss the details of his peg plan in public because it might spawn currency speculation. So, we don’t know exactly what he has up his sleeve. But, we know enough to conclude that if the opposition embraces any one of the many variants of a pegged exchange-rate regime, it will be playing with fire, and it will fail. Indeed, pegged exchange-rate systems are fatally flawed. They have a near-perfect record of failure. In contrast, currency boards, the system Hausmann eschews, have a perfect record of success. To understand why, consider that there are three distinct types of exchange-rate regimes: floating, fixed, and pegged, each with different characteristics and results (see accompanying table). Although floating and fixed rates appear dissimilar, they are members of the same free-market family. Both operate without exchange controls and are free-market mechanisms for balance-of-payments adjustments. With a floating rate, a central bank sets a monetary policy but has no exchange-rate policy—the exchange rate is on autopilot. In consequence, the monetary base is determined domestically by a central bank. With a fixed rate, there are two possibilities: either a currency board sets the exchange rate but has no monetary policy—the money supply is on autopilot—or a country is “dollarized” and uses a foreign currency as its own. In consequence, under a fixed-rate regime, a country’s monetary base is determined by the balance-of-payments, moving in a one-to-one correspondence with changes in its foreign reserves. With both of these free-market, exchange-rate mechanisms, there cannot be conflicts between monetary and exchange-rate policies, and balance-of-payments crises cannot rear their ugly heads. Indeed, under floating- and fixed-rate regimes, market forces act to automatically rebalance financial flows and avert balance-of-payments crises. Fixed and pegged rates appear to be the same on the surface. However, they are fundamentally different: pegged-rate systems often employ exchange controls and are not free-market mechanisms for international balance-of-payments adjustments. Pegged rates require a central bank to manage both the exchange rate and monetary policy. With a pegged rate, the monetary base contains both domestic and foreign components. Unlike floating and fixed rates, pegged rates invariably result in conflicts between monetary and exchange-rate policies. For example, when capital inflows become “excessive” under a pegged system, a central bank often attempts to sterilize the ensuing increase in the foreign component of the monetary base by selling bonds, reducing the domestic component of the base. And, when outflows become “excessive,” a central bank attempts to offset the decrease in the foreign component of the base by buying bonds, increasing the domestic component of the monetary base. Balance-of-payments crises erupt as a central bank begins to offset more and more of the reduction in the foreign component of the monetary base with domestically created base money. When this occurs, it is only a matter of time before currency speculators spot the contradictions between exchange-rate and monetary policies (as they did in the Asian financial crisis of 1997-98) and force a devaluation or the imposition of exchange controls. Like the big devaluations during the Asian financial crisis, the same contradictions tangled up Argentina’s Convertibility System, which was not a currency board, and resulted in a maxi-devaluation and chaos. So, forget pegs. They will always fail. What about floating? As a means to smash hyperinflation in a country in which no institutions have a semblance of credibility, floating would be a disaster. Just look at what happened to Indonesia during the Asian financial crisis. On the advice of the International Monetary Fund, Indonesia floated the rupiah on August 14, 1997. But, the rupiah didn’t float on a sea of tranquility—it sank like a stone. In consequence, inflation soared, and food riots ensued. These events ultimately forced Suharto out of office on May 21, 1998. Alas, even an allusion to this exemplary historical record is absent from most of the contemporary literature, including Hausmann’s “National Plan: the Day After.” Venezuela’s opposition must take note before its fingers are burnt.